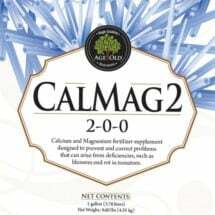 Contains calcium to prevent blossom end rot. Happy Frog Organic Tomato Fertilizer is precisely designed for use on all varieties of tomatoes, vegetables, soft fruits and berries. The balanced ratios between nitrogen, phosphorus and potassium will allow the plant to feed vigorously while producing abundant high quality fruit set. 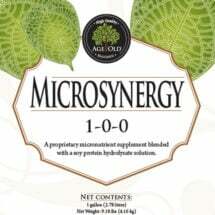 Also includes mycorrhizae and humic acid. Potted Plants: Mix 2 Tbsp per gallon of soil or topdress 1/4 to 1 cup per established plant, monthly throughout the growing season. 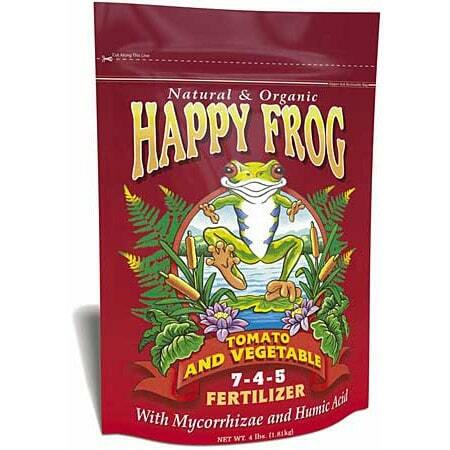 Gardens: Use 1/4 to 1 cup per established plant or topdress 1 to 5 cups per 10 sq. ft. of planting area, monthly. 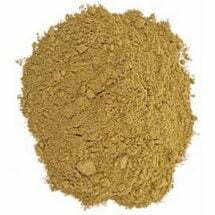 Ingredients: Feather meal, bone meal, hydrolyzed fish, fish meal, fish bone meal, alfalfa meal, sulfate of potash magnesia, blood meal, bat guano, rock phosphate, kelp meal and gypsum. The best return on your investment will come from good soil preparation. Soil balance is the key to good plant nutrition and overall plant health. Maintaining a soil pH of 6.3 to 6.8 maximizes the availability of phosphorus uptake by the plant. Always adjust fertilization schedule to plant’s response. 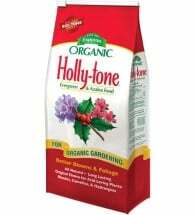 Used by professional growers, Holly-tone is the original choice for acid-loving plants.